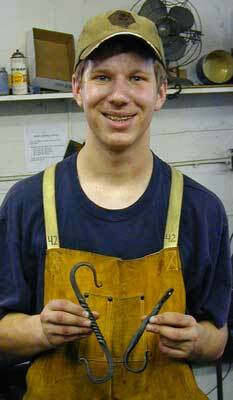 A bit of net-fame for our students. 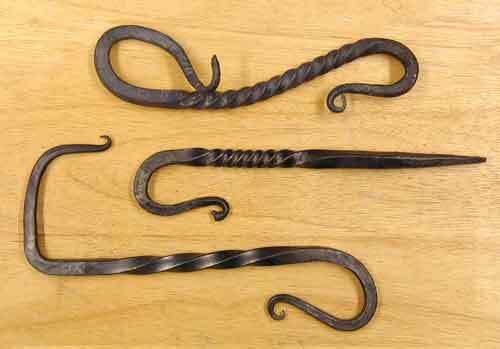 Note: There is a sorted version of this page (also available in the menu to the left) that will load faster. 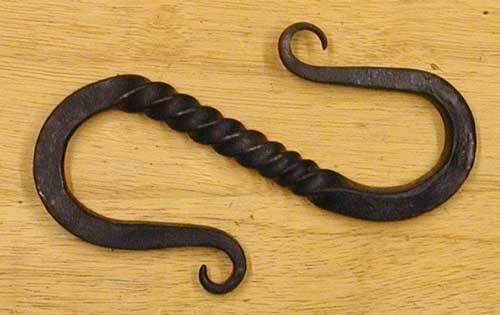 If you have this page bookmarked, seriously consider changing the bookmark, this page will go away eventually. 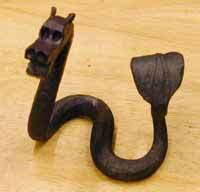 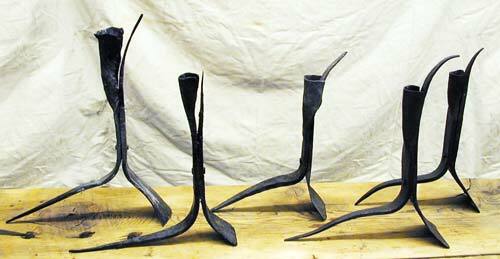 Forge welded flux spoon, punch & chisel, sharp right angle, carved dragon. 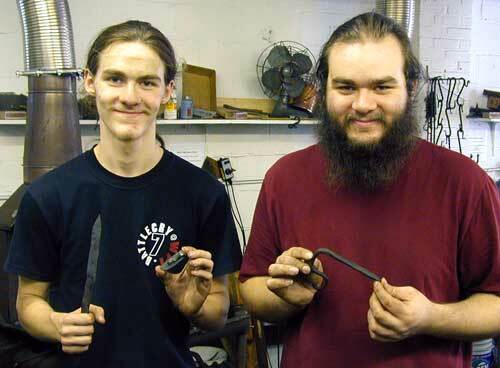 2 simple "blacksmith" knives (aka "Pixie Stickers"). 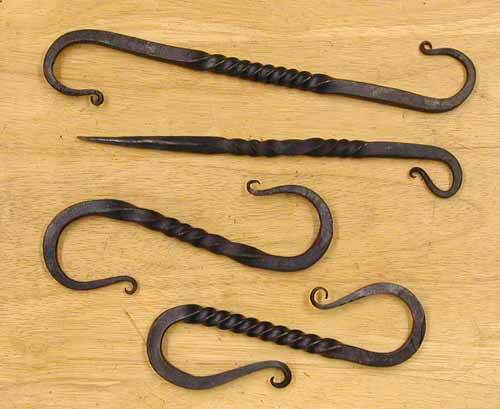 4 simple "blacksmith" knives (aka "Pixie Stickers"). 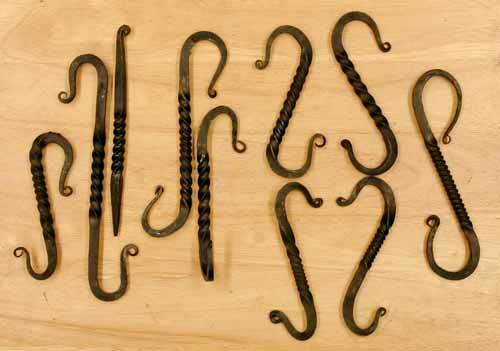 2 Wall hooks and 2 S-hooks. 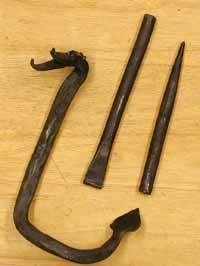 3 S-hooks and a garden stake/pointer. 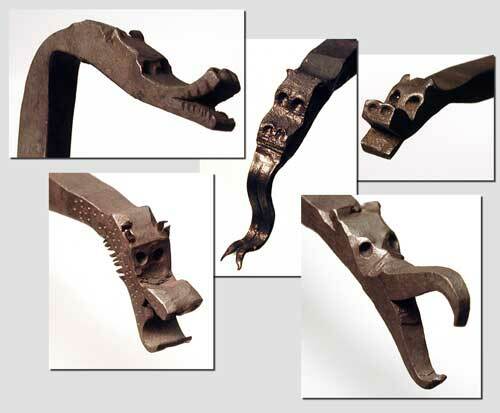 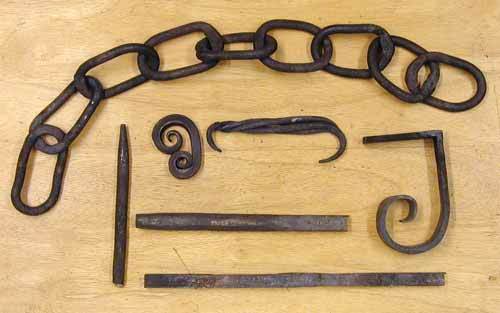 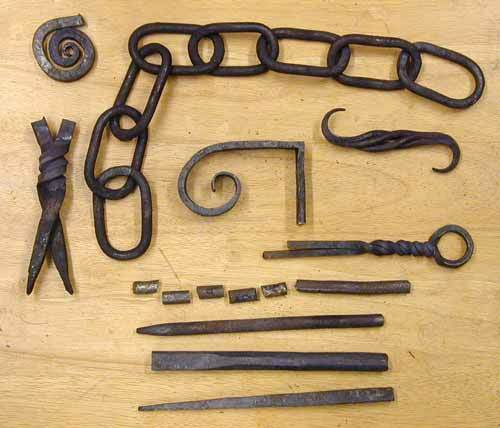 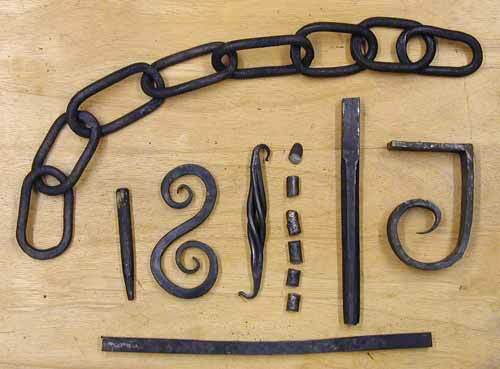 Forge welded chain (one link each meeting), eye-punch, high carbon steel hardened, tempered and broken, square-octagonal-round, welded basket s-hook, 2-piece weld, forging-to-a-drawing, scrolling-in-the-air. 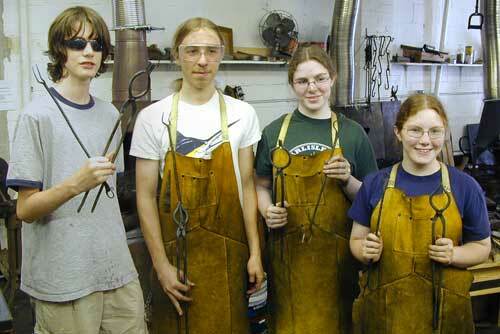 We ended up really picture-short for this class. 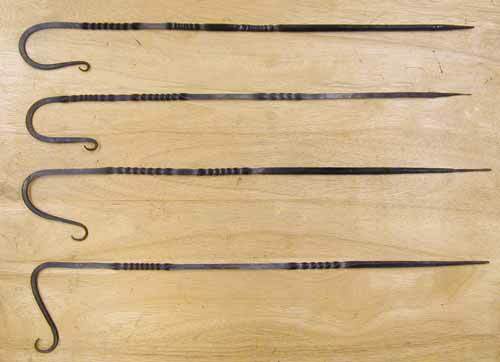 5 S-hooks, 2 wall hooks, and a garden stake. 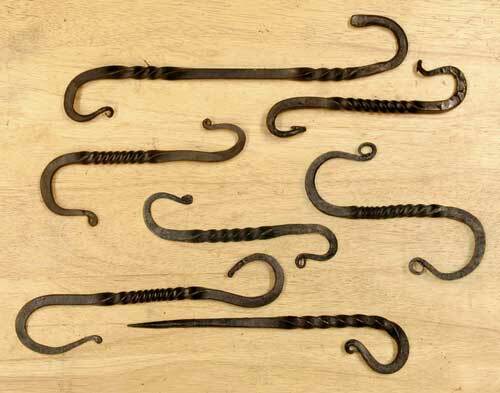 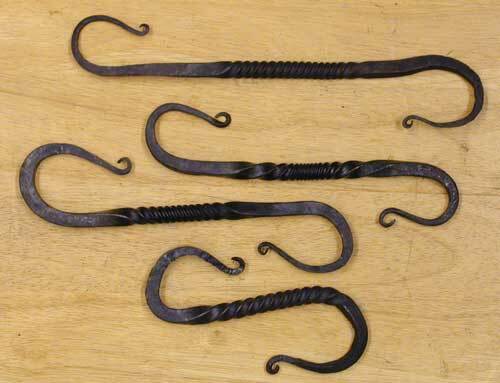 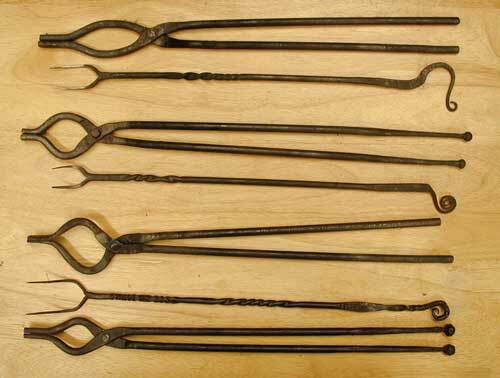 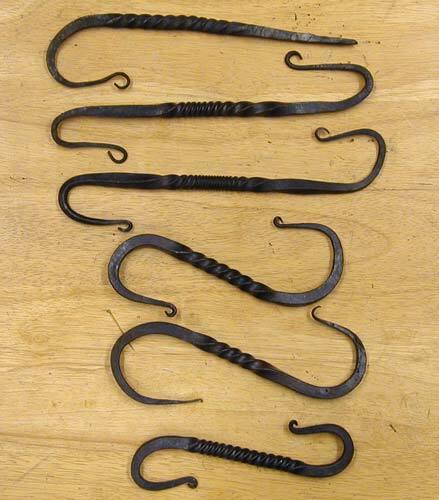 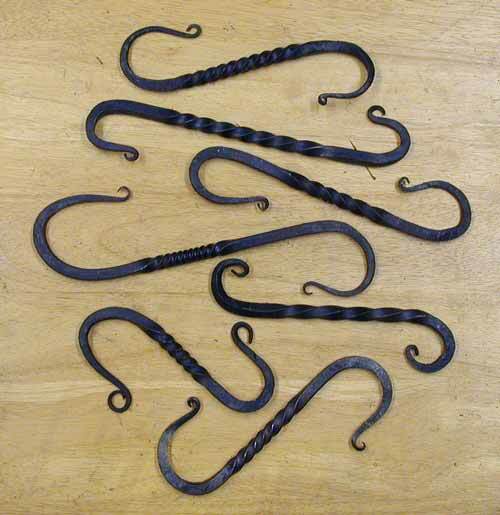 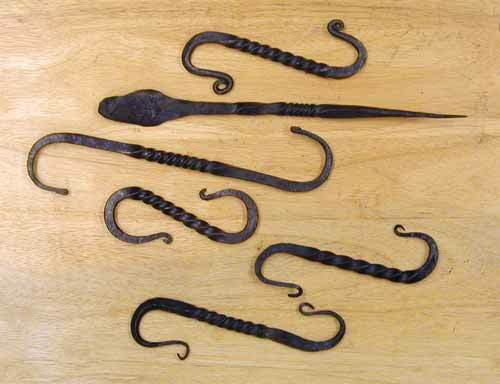 Seven S-hooks and a wall hook. 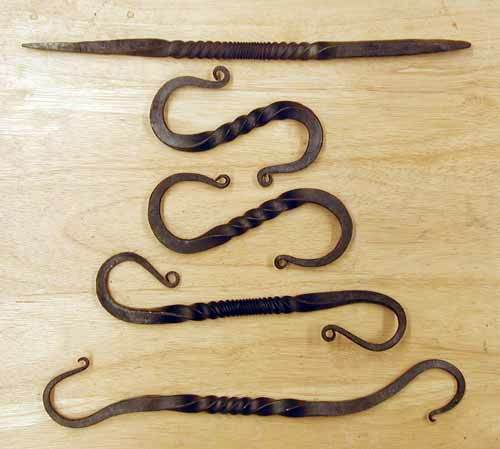 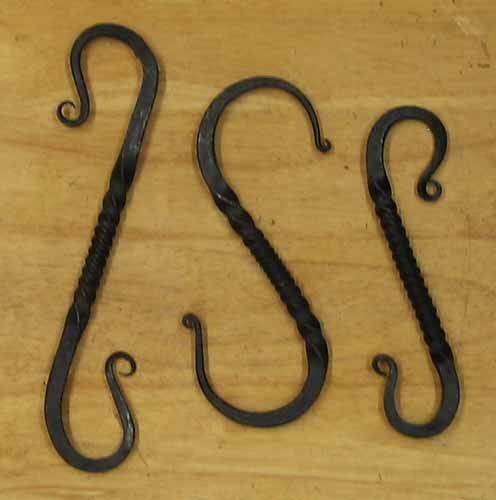 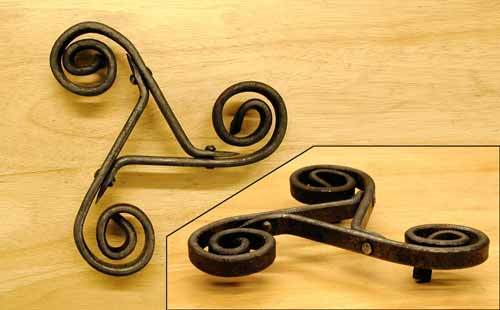 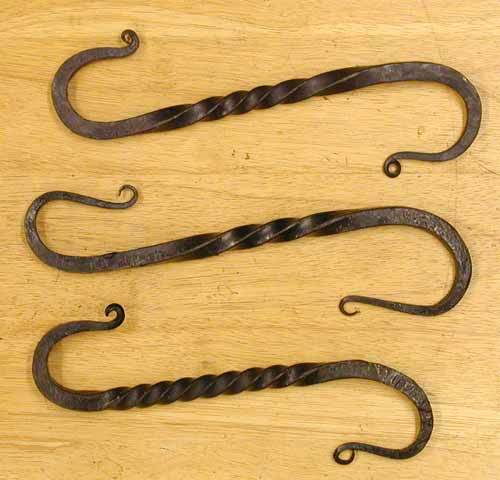 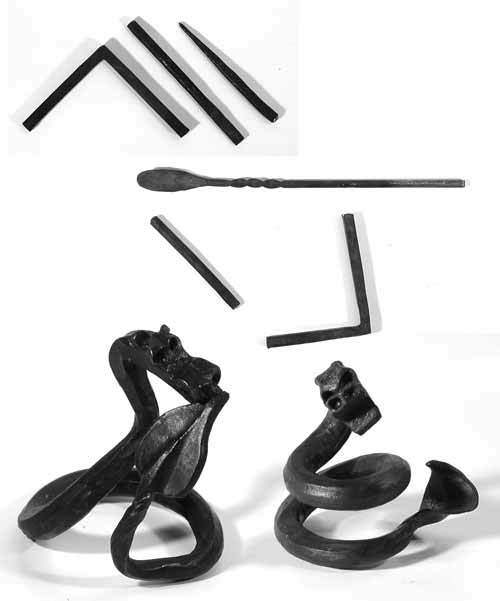 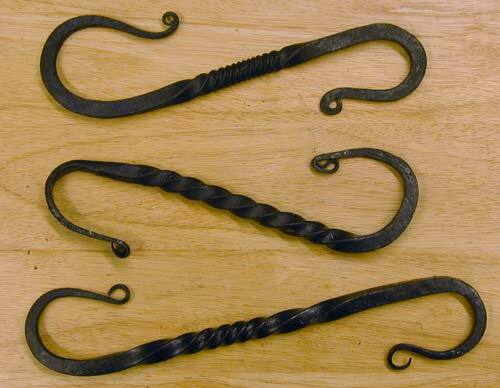 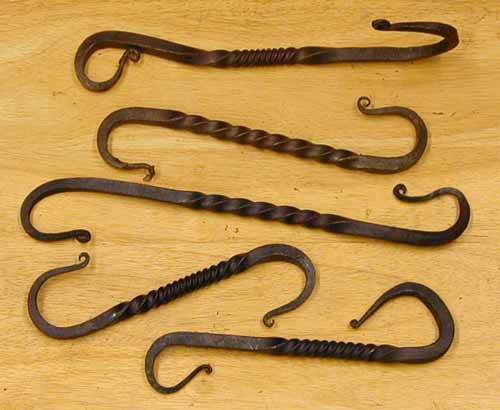 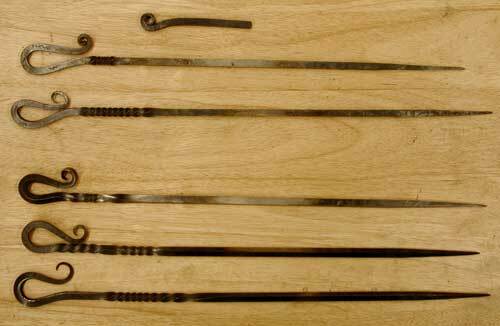 Four S-hooks and a wall hook. 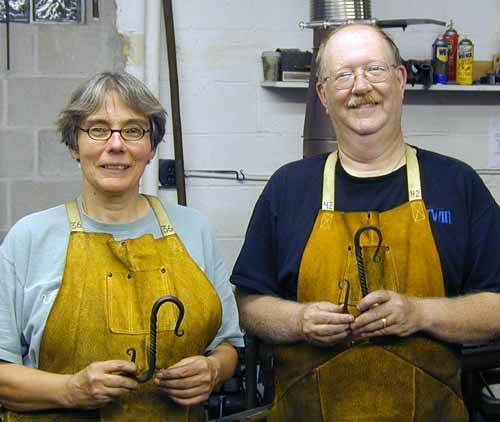 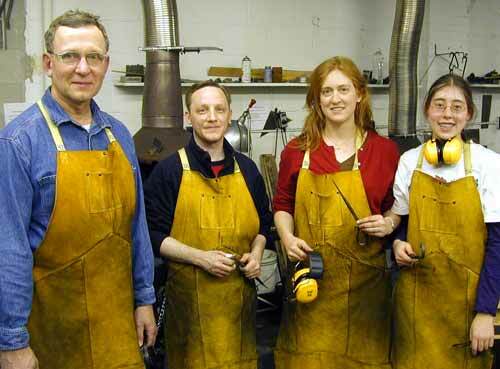 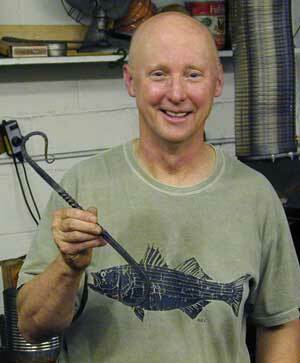 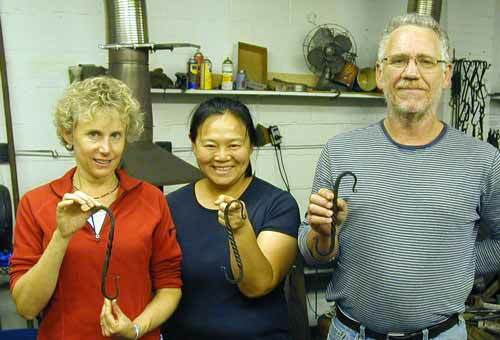 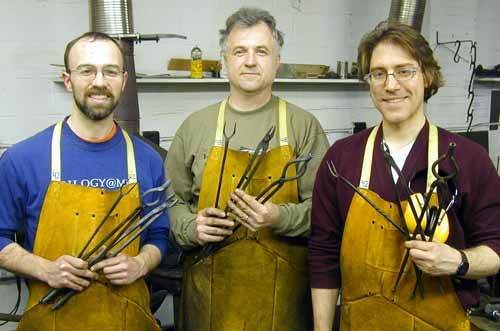 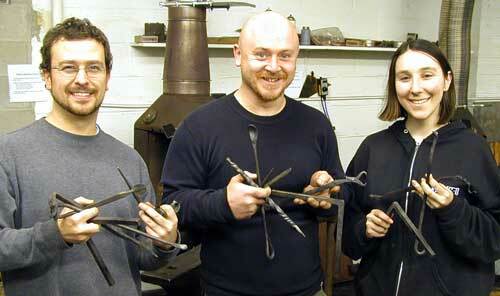 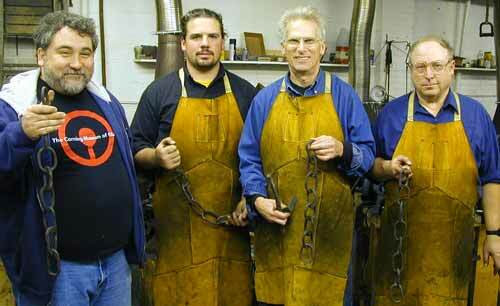 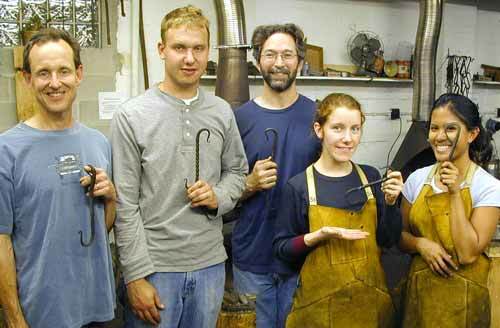 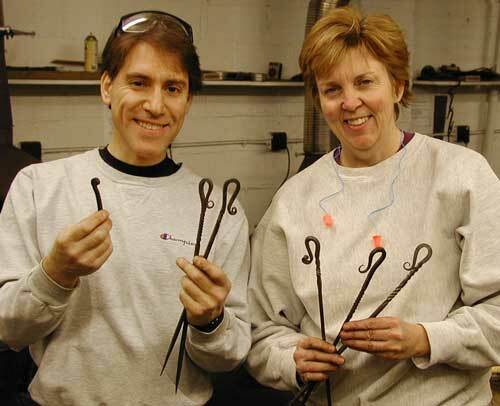 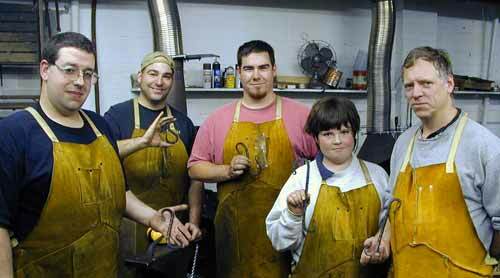 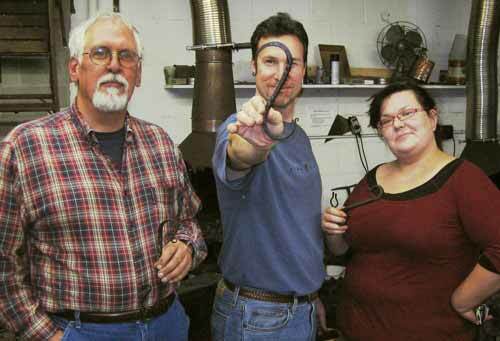 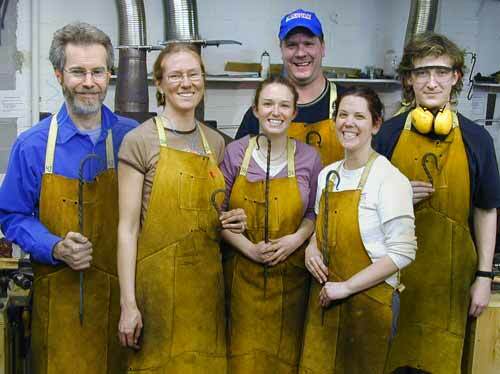 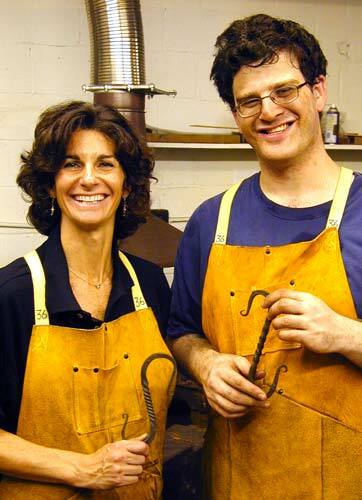 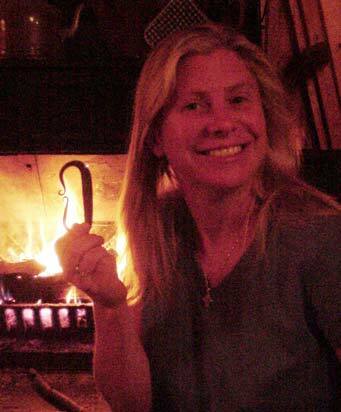 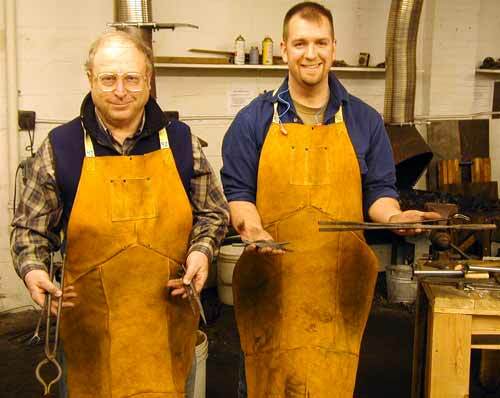 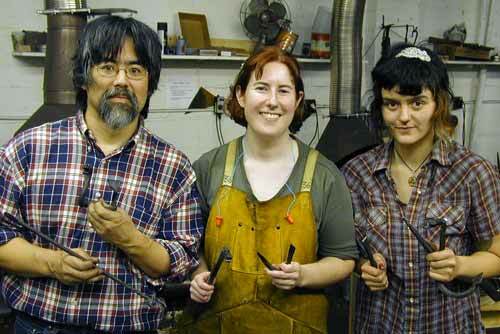 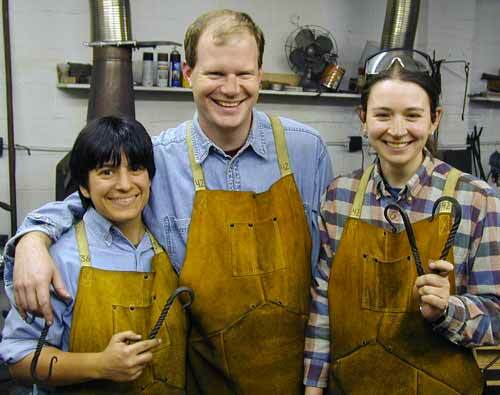 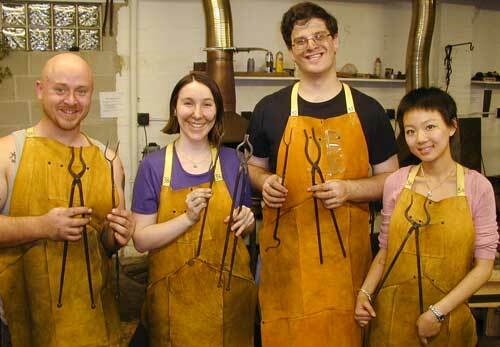 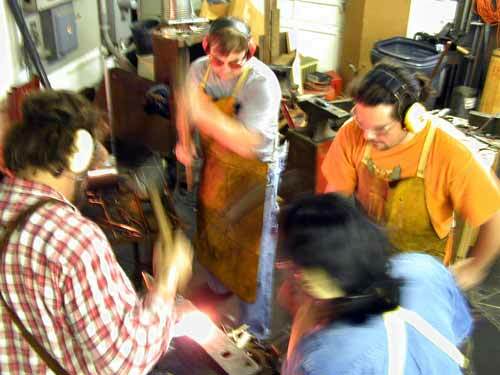 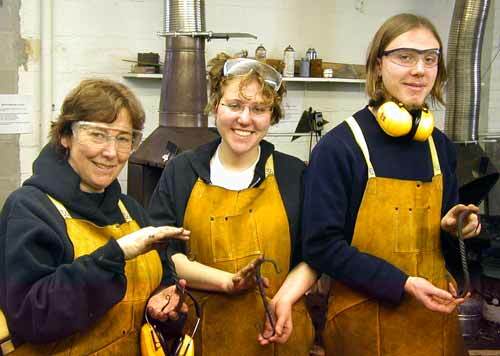 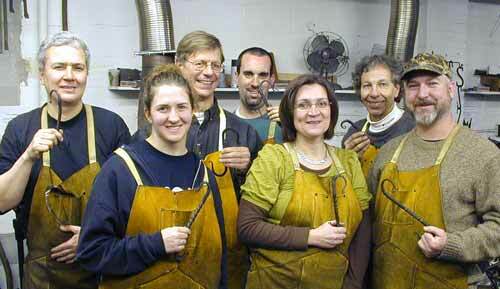 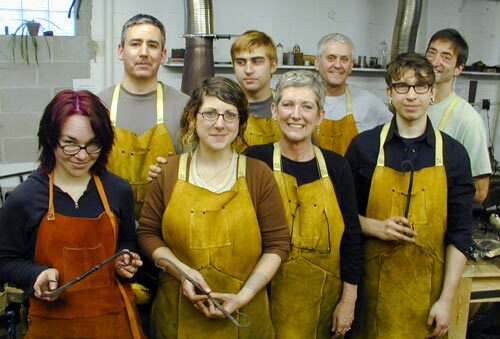 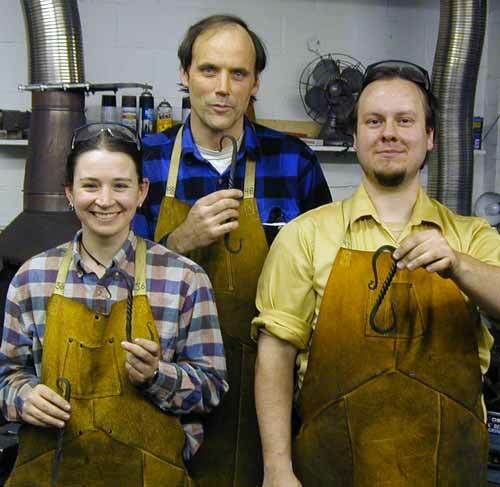 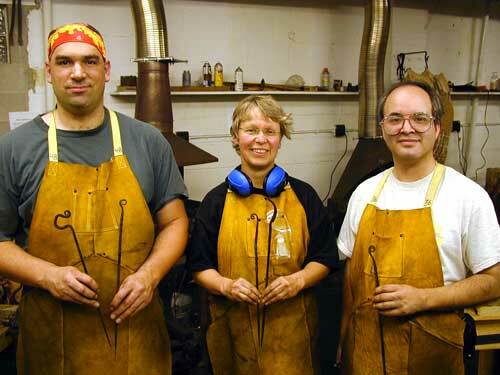 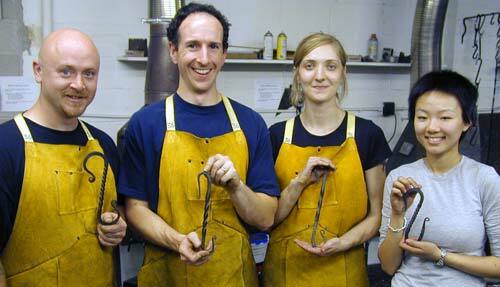 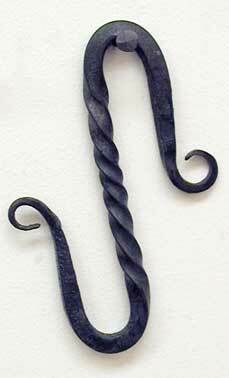 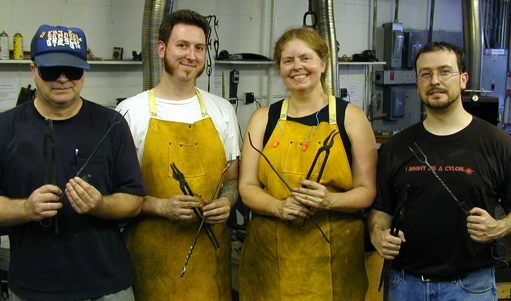 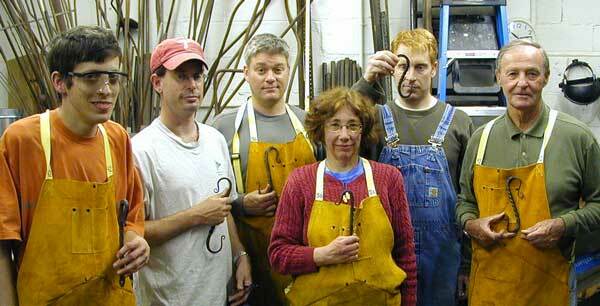 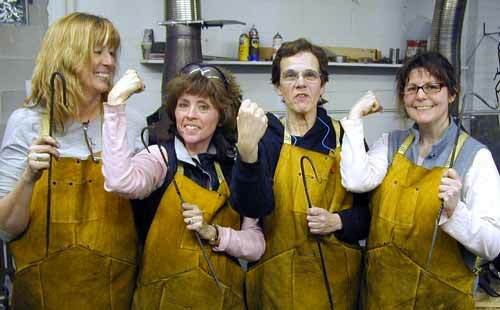 We met twice a week and made barbecue forks and blacksmith tongs. 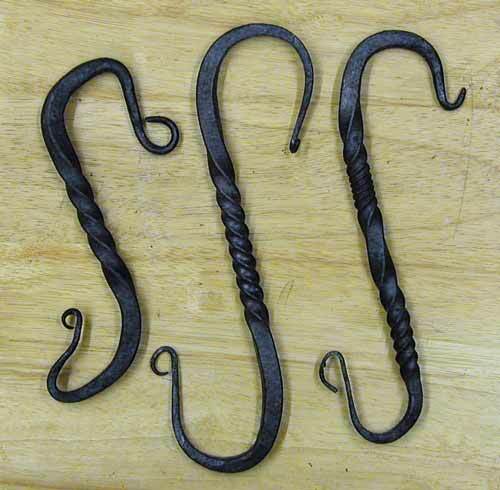 And learned a bunch of techniques along the way. 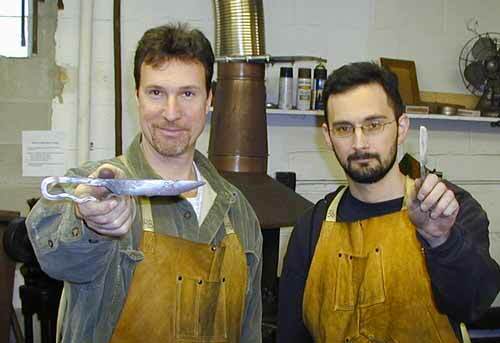 These two had been away from the hammer for a few years, so we were finding out where they stood. 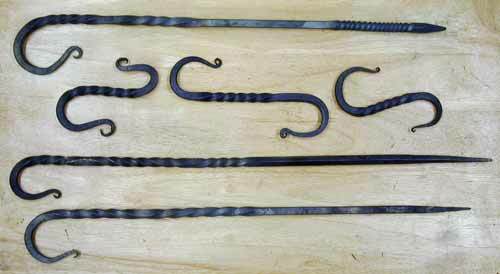 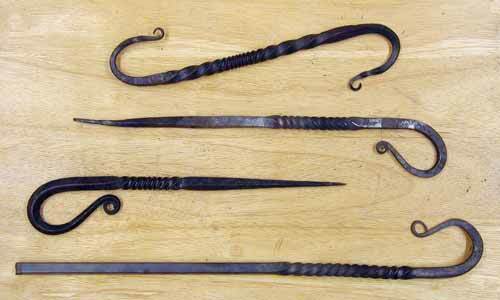 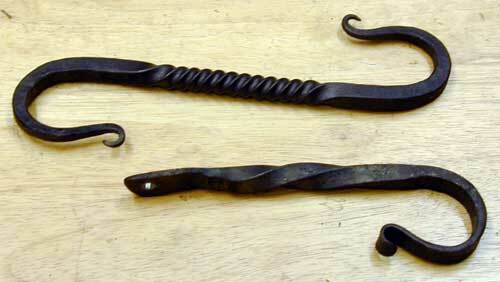 A mantle hook, two forge welds, a pendant and the start of a knife. 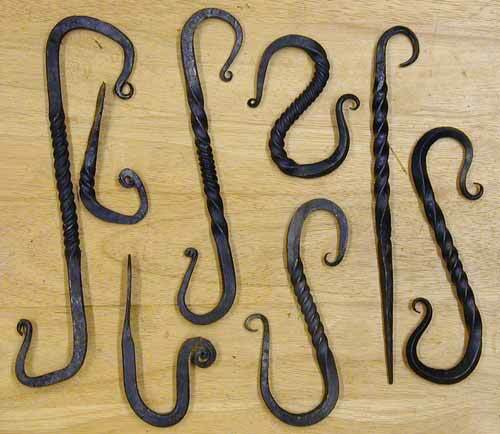 One very nice short S-hook. 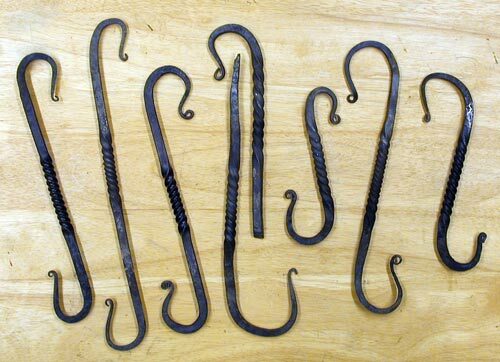 One very nice long S-hook. 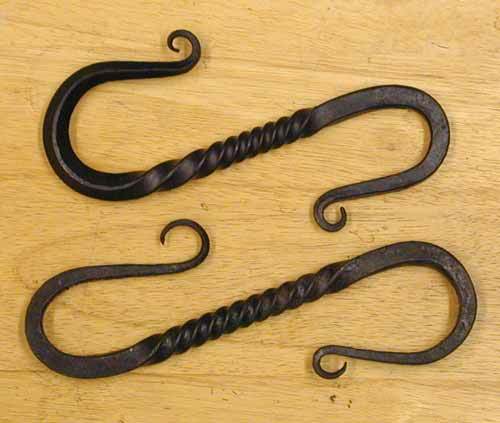 An S-hook and a J-Hook done quickly and quite well. 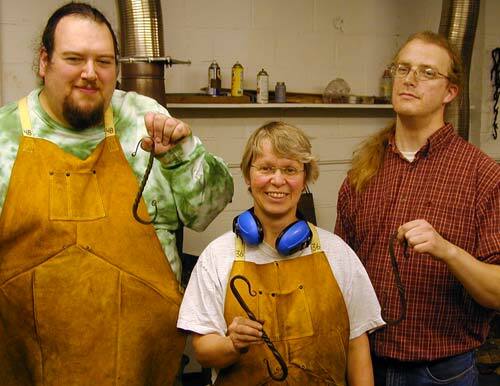 They get their own page. 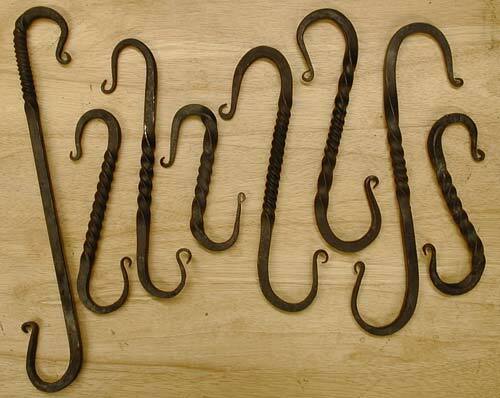 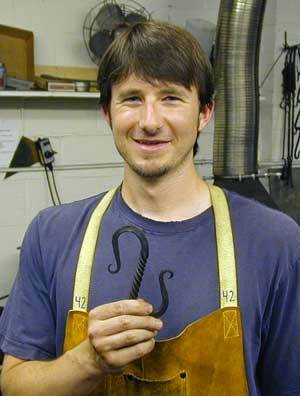 We chose to make S-hooks. 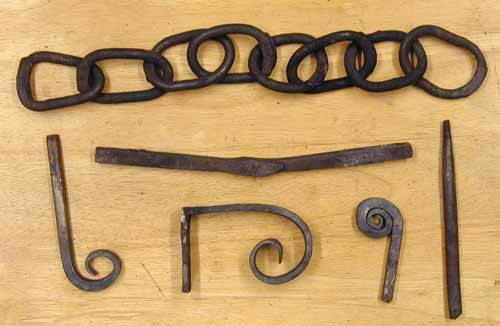 Forks and Tongs and more tongs and some sweet little rivets made using the monkey tool as sort of an upside-down header. 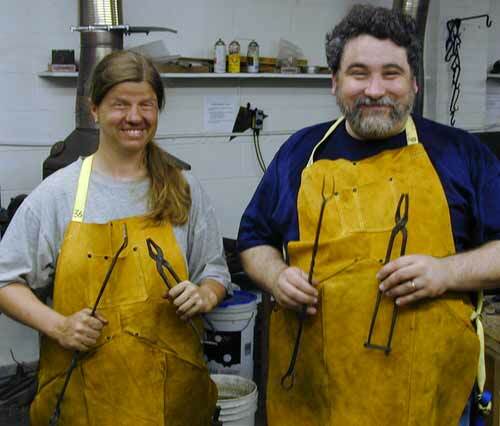 They have their own page There are too many pictures for here. 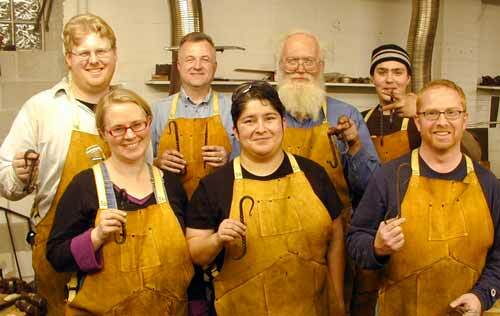 We got off to a slow start what with finagling aprons and eyegear and such. 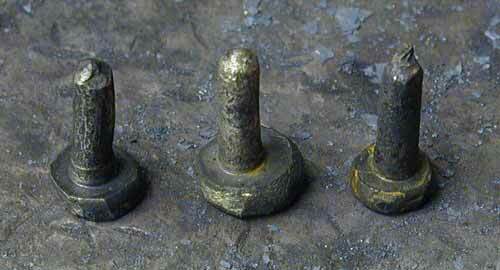 And we ran over time. 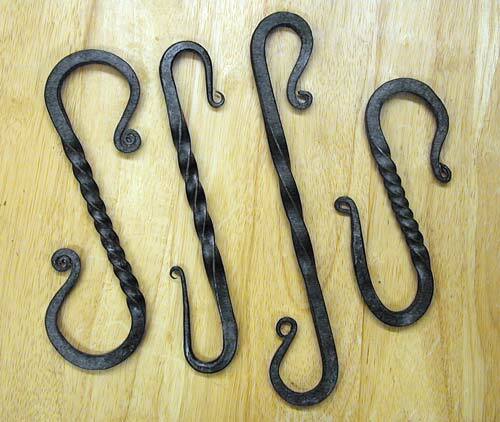 In the end we got six 's' hooks and two nearly 'j' hooks. 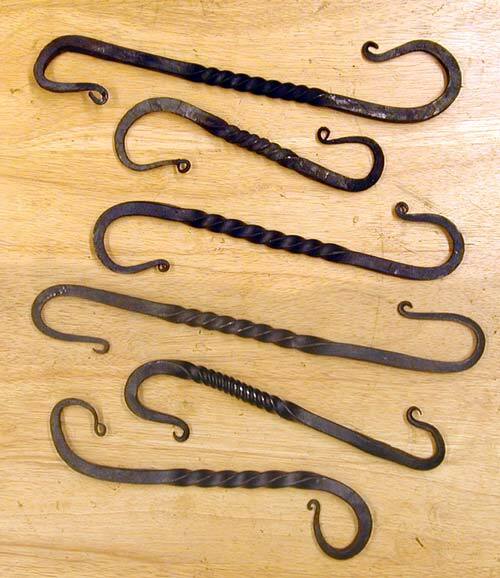 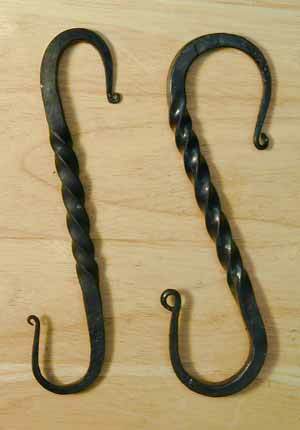 The class had seven students but none were attached to the idea of cooking skewers, so we made S-hooks instead. 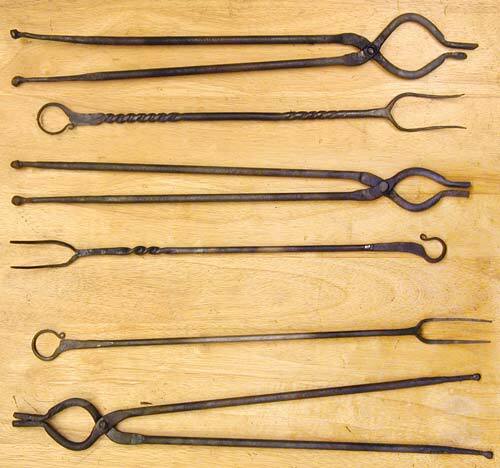 Lessons were learned, some ends were burned, but only two fingertips touched hot metal that I know of. 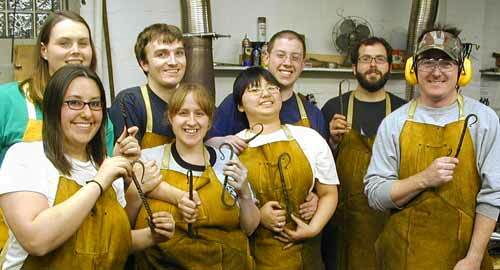 The class was small and they chose to make S-hooks instead of the skewers. 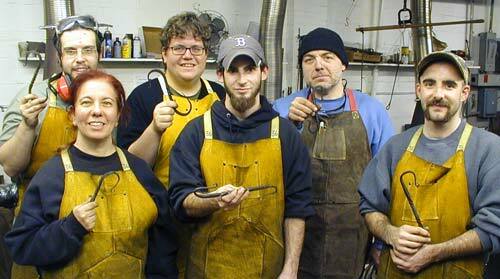 Nate finished early and got a good start on making a long thin taper. 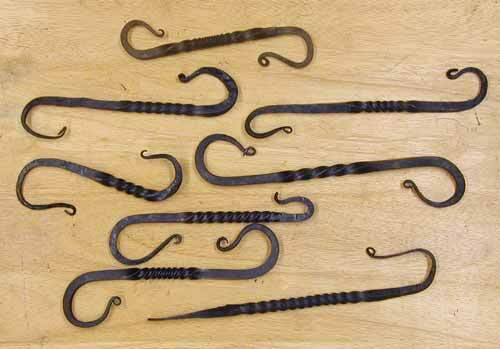 These guys moved along pretty well. 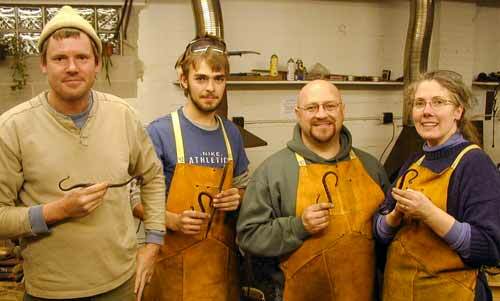 The father and son finished with about 45 minutes to spare and managed to squeak out a second hook each. 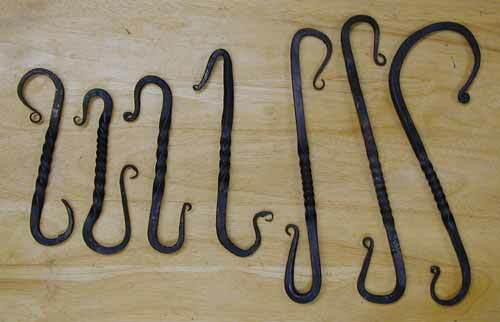 Tamara made a 90° hook. 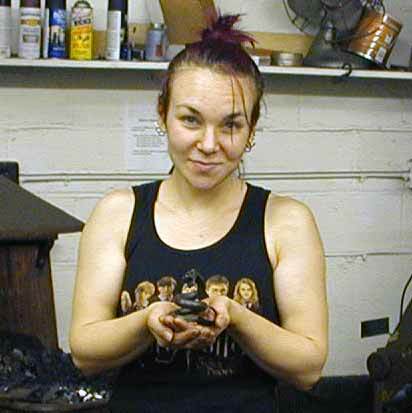 The polishing was done at Metalwerx. 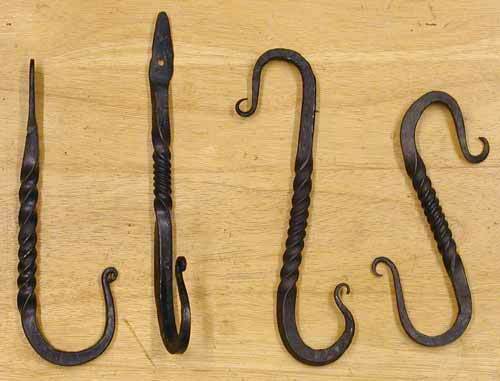 Four hooks and a pointer-thing. 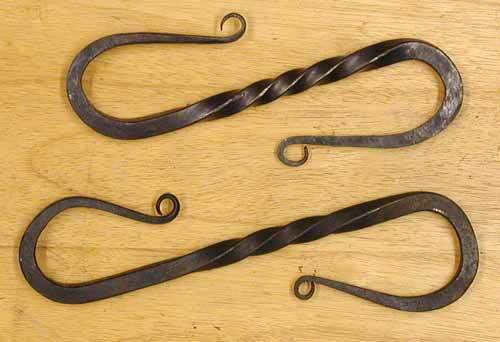 These two whipped right along and made some lovely twists on the way. 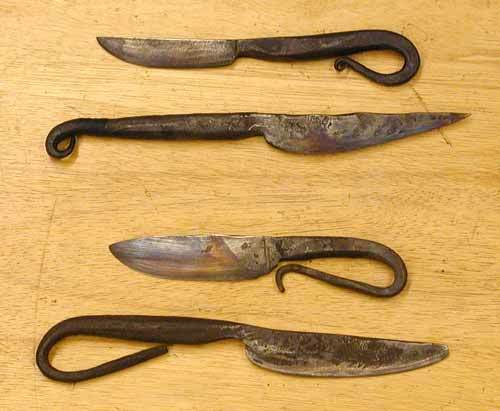 Three students three knives, we sharpened the bottom one, it shaves. 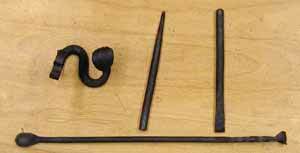 The rest of Rudiments II. 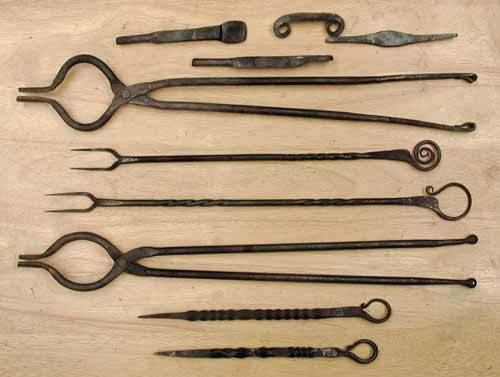 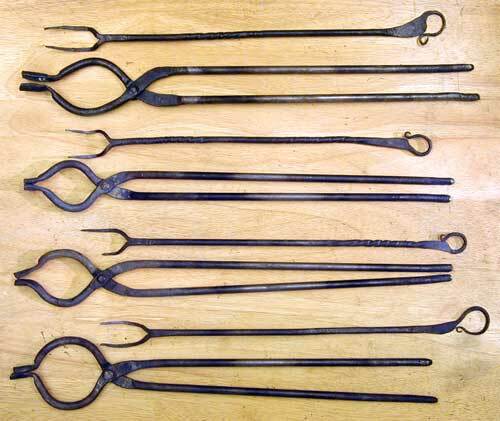 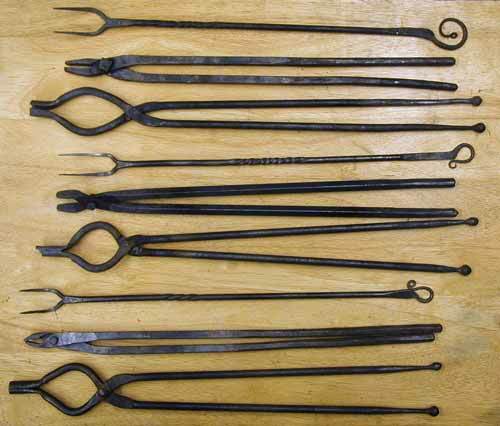 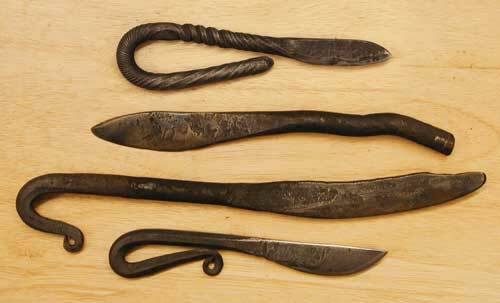 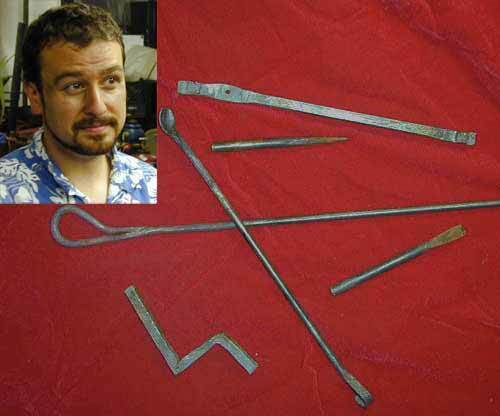 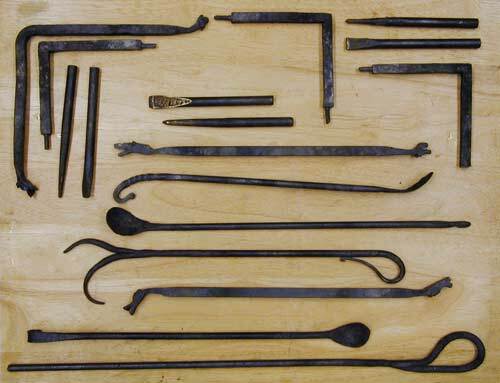 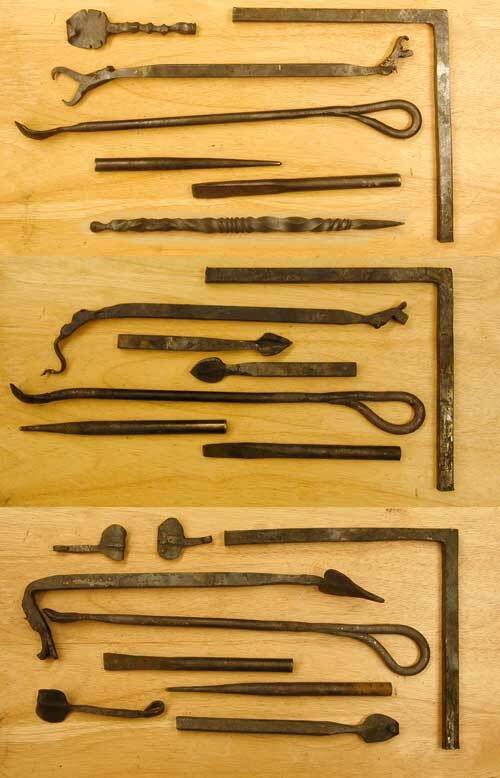 Chisels, centerpunches, dragon-heads, forge-welded flux-spoons, loop welds, square bends, round tenons. 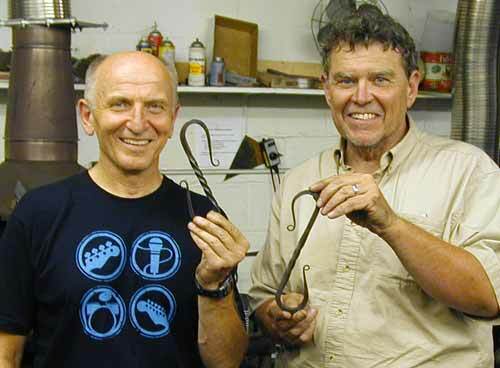 Hooks from the June 8 '07 "A Taste... " class.